Earlier this week, Maggie, Kate and I successfully ran the Maui Oceanfront Marathon. It’s an experience I won’t soon forget. The race started in Wailea and followed North Loop Coastline Road Highway 30 all the way to Old Lahaina, ending a block from the famous Banyan tree in Lahaina Banyan Court. Maggie finished in under five hours and was waiting at the finish line with Joe and Tom when Kate and I crossed. We ran along the ocean for most of the race. We ran the marathon to celebrate our 50th birthday year. Along the way, we saw dozens of humpback whales, visited with some inspiring people and — early in the race — overcame a technical challenge. We followed the ocean most of the race, and the whales breached and slapped their tails the entire time. For that reason alone, I would highly recommend the marathon to those considering a 26.2-mile destination race. Kate and I ran for several miles with a couple striving to run a marathon in all 50 states for the second time. Their passion and commitment were inspiring, particularly as they shared the story of a man we’d passed several miles earlier who’s run more than 1,500 marathons in every state and many parts of the world. In early November, as our training runs moved beyond 15 miles, Kate and I decided to adopt Jeff Galloway’s Run-Walk-Run Method to increase our range and reduce our pace. We ultimately settled on two minutes of running and one and a half minutes of walking at an overall pace of 12.5 minutes/mile and a target marathon completion time of 5:30. Somehow, I inadvertantly turned off the run-walk-run alert on my Garmin Vivoactive 3 in the first mile of the marathon. After unsuccessfully spending the walking portions of the next five miles of the race trying to turn it back on, Kate and I decided to manually track our run and walk times the balance of the marathon, which proved to be a good distraction for me. Ultimately, we ran an average pace of 14:08 minutes/mile and finished the race in 6:14, about 45 minutes slower than our goal. We feel great about the result given the heat, unexpected hills and faster-than-planned pace the first half of the race because of our technical challenge and adrenaline. Completing the marathon taught me a lot about how much we can accomplish when we commit ourselves to a challenging task, adopt a plan to accomplish it and work to make it a reality. Kate and I missed more than a few training runs during our marathon preparation, but we made adjustments and accomplished our goal. The parallels between our experience and everyday life are obvious. I encourage you to consider committing to a personal goal that stretches you — whether physical, intellectual or in another area — and creating a plan to bring it to fruition. Finishing the marathon was an amazing, unbelievable experience. What will stay with me, however, is the affirmation that I can set and accomplish goals that stretch me more than I thought possible. Kate and I registered for two races this weekend! We’ll run the Cliffhanger Run 8K, which benefits Kansas City University of Medicine and Biosciences, on October 28. It follows a beautiful course along Kansas City’s Gladstone Boulevard. And on December 2, we’ll do our first trail race — the Alternate Chili 10-Mile Trail Run — in Wyandotte County Lake Park. It’s a 10-mile preparatory run to the “Psycho WyCo” Run Toto, Run Trail Run in February, for which I’m considering registering. 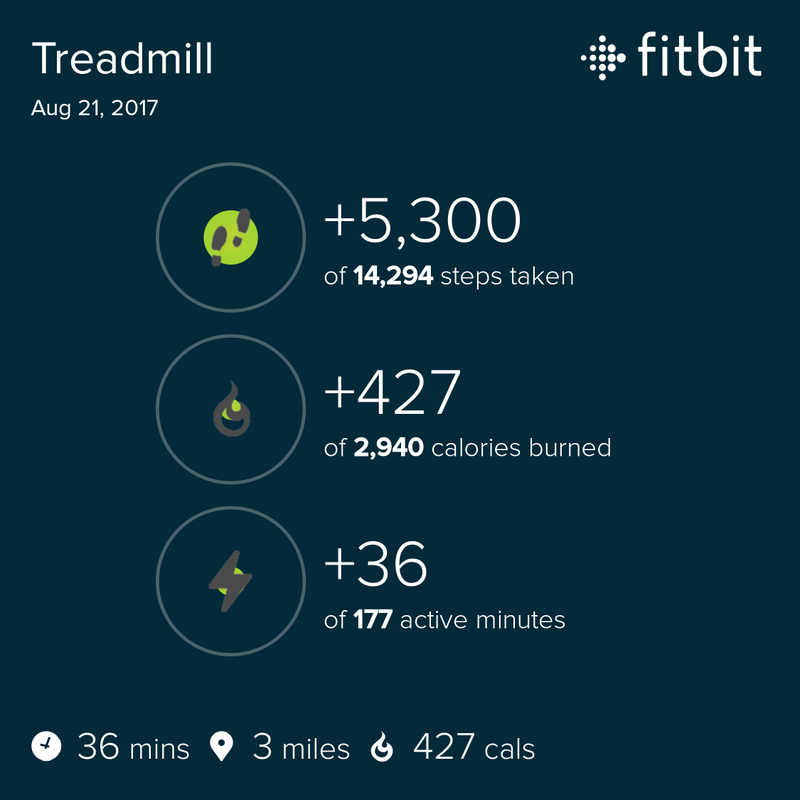 A nice, slow eclipse day treadmill run! It was great to catch up with Rad Long, a super guy and longtime friend, who was using the treadmill next to mine at the Roger T. Sermon Community Center. 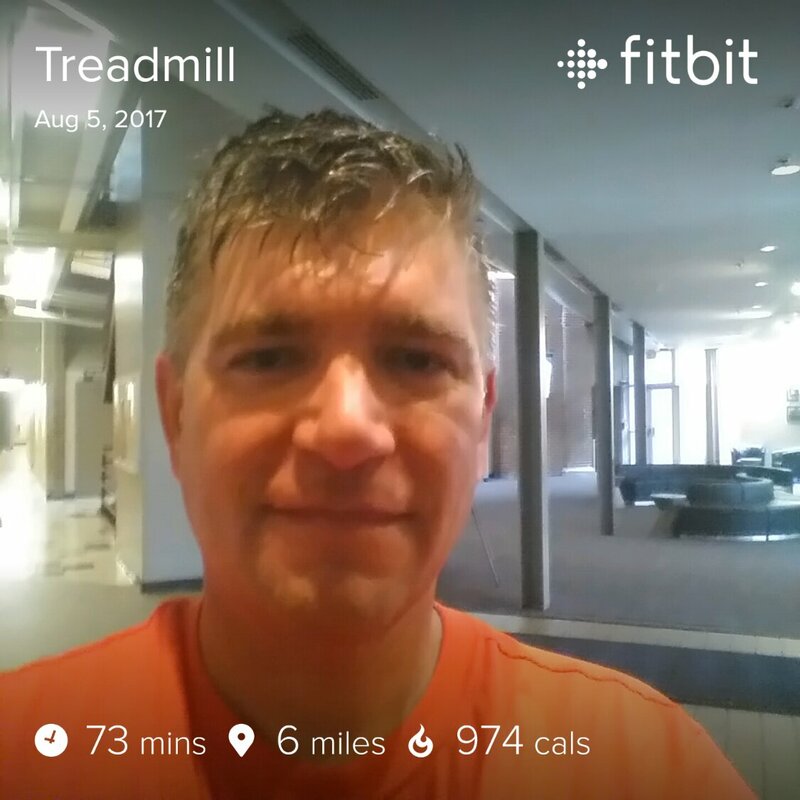 It’s raining in Kansas City today, so I hit the treadmill at the Roger T. Sermon Community Center in Independence. It was a slow six miles, but I got ‘er done!